Sukkot is one of my favorite holidays for the obvious reasons: a harvest festival, the ultimate farm-to-table holiday filled with delicious meals eaten outside. 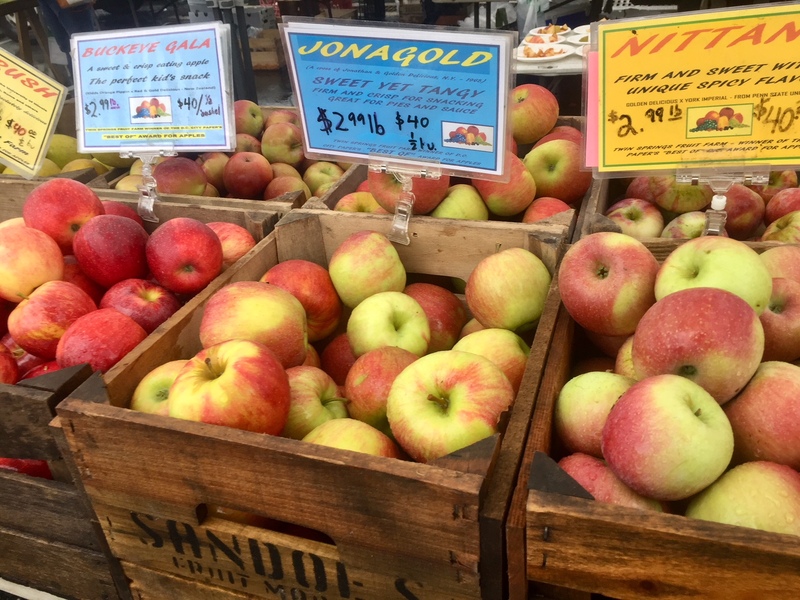 I offer my recipe this year–inspired by the abundance of delicious apples and squash at farmers markets–with the note that the holiday, especially after Hurricane Florence, is a time for us to reflect upon and examine our fragility and impermanence, ourselves, our food systems and the world around us. Hurricane Florence shines a spotlight on the temporary, fragile nature we live in and also our failure as God’s partners to protect our planet. The stories of devastation and neglect in North Carolina are the reality of our food systems and poverty in the US (currently 40.6 Americans live in poverty and 41 million struggle with hunger).The only people left behind-literally-were rescue workers and those too poor to leave. The other group left behind in North Carolina were the millions of chickens and pigs raised in Confined Animal Feeding Operations aka CAFOs (and yes, these chickens can be killed for kosher meat). They were left to die and now their sewage has polluted local waterways, leaving flood waters toxic and huge areas without drinking water. And most people who work in these CAFOs are extremely poor with no job protection in dangerous work conditions. But, the ugliness of Florence has also brought to the forefront some the incredible work that many are doing in North Carolina and beyond. Whether it’s the immediate work to rescue people or get them food and water or save animals that would otherwise be euthanized, to the long-term efforts to stop pollution from industrial farms and lift people out of poverty. I heard the incredible Rev. William Barber speak recently. He started the Moral Mondays Movement in North Carolina and now runs the Poor People’s Campaign: A National Call For Moral Revival. It is people like him-and countless unsung heroes-who are working to “challenge” poverty and ecological devastation-interconnected issues that must be addressed together that are magnified by Florence. And as the impacts of climate change continue to worsen, it is the poorest people in the US and around the world who will suffer the most. Each of our actions-no matter how seemingly mundane, can have huge consequences. Collectively, we contributed to the intensity and consequences of Florence, whether through our carbon emissions, food consumption or support for businesses that impoverish people. But, as Rev. Barber says, we are also part of the solution to rebuild in a more humane, economically just and ecologically sound way. 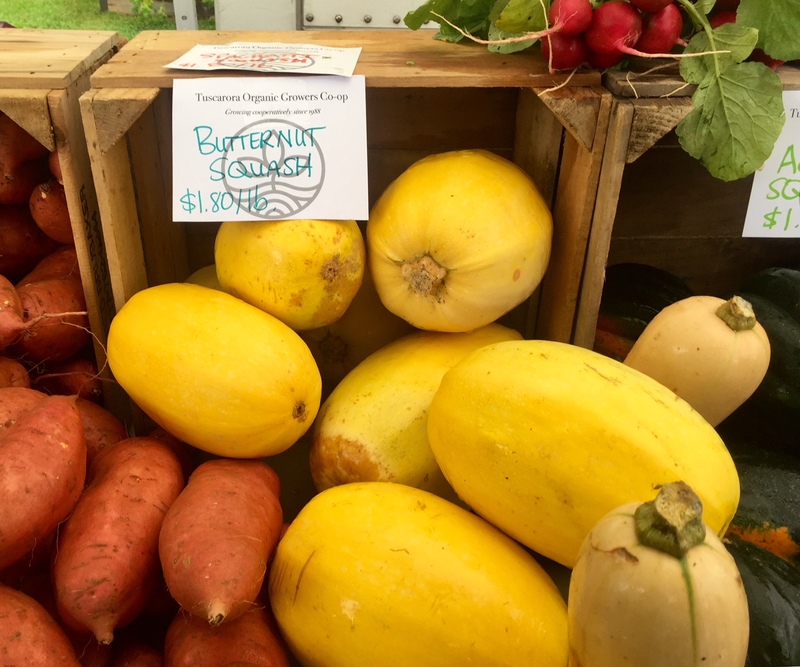 Though poverty, climate change, and animal welfare can seem overwhelming to solve, at the simplest level, when we each choose to purchase food from a small farmer rather than an industrial farm, not eat meat, or shop at a supermarket where employees are paid living wages with benefits, we are supporting workers and helping our environment and animals. Despite the seriousness of Florence, Judaism still encourages us to celebrate the miracles and beauty of lifecycles, holidays, Shabbat and other times in our calendar. And, Sukkot is a time for us to celebrate and bring more light into the darkness of the world. We need to also take care of ourselves and have times of joy, including hearty holiday meals surrounded by friends and family in a sukkah. 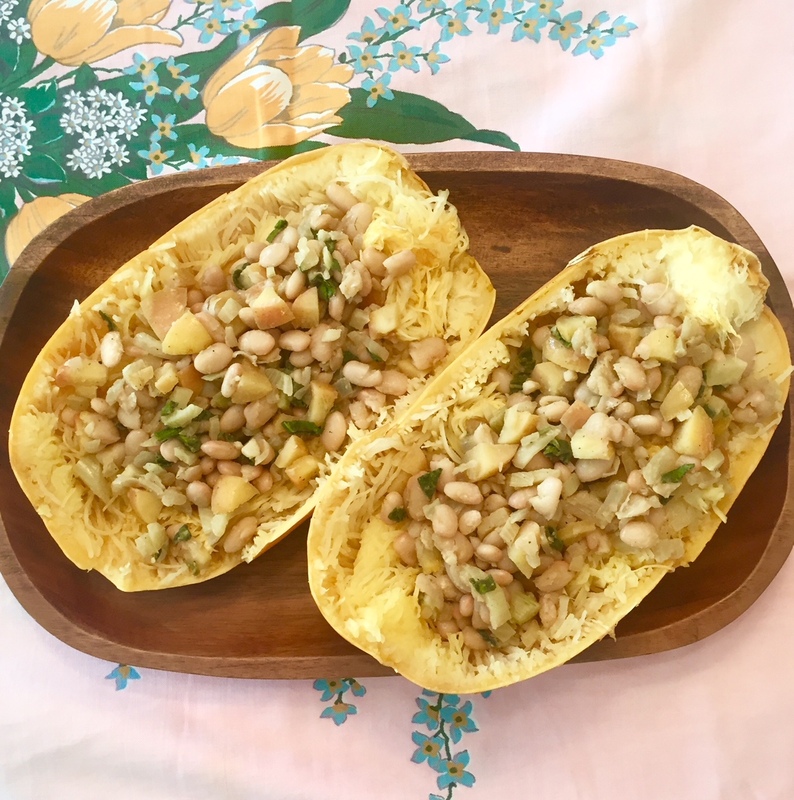 The dish I prepared for Sukkot is stuffed with a variety of delicious ingredients, to honor the harvest celebrate and to include an abundance of foods found at farmers markets now. 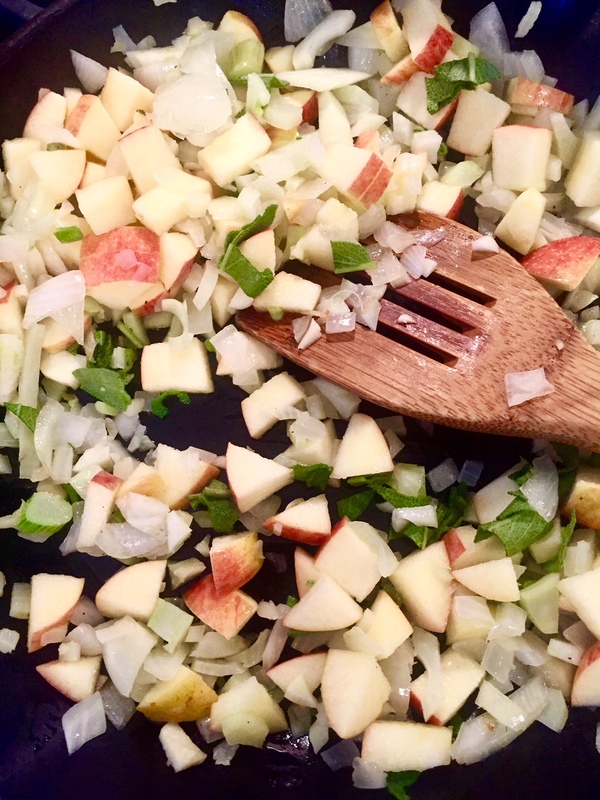 This year I decided to put to use a spaghetti squash that had been around for awhile along with the some of the incredible apples available now and sage, an herb that I love using lately. PS: Click here and here for more recipes and resources from my other Sukkot posts. Pre-heat oven to 350 degrees. Poke holes in the squash and bake until soft, approximately 35 minutes. When it is finished, remove from heat and let cool. Over medium heat in a large pan, add about 1 tbsp olive oil. Add onion and fennel and cook until they start to soften. Add apple, garlic and sage. Mix well and continue to cook over low/medium heat for about 10 minutes until they are soft. Add vegetable broth as needed to prevent the ingredients from sticking or burning. Add the white beans just before it is finished so that they are warm. Add salt and pepper to taste and drizzle with a fruity olive oil. Once the squash has cooled, slice open and remove seeds. Add the fennel-apple-bean mixture. Option to add shaved vegan parmesan cheese on top. 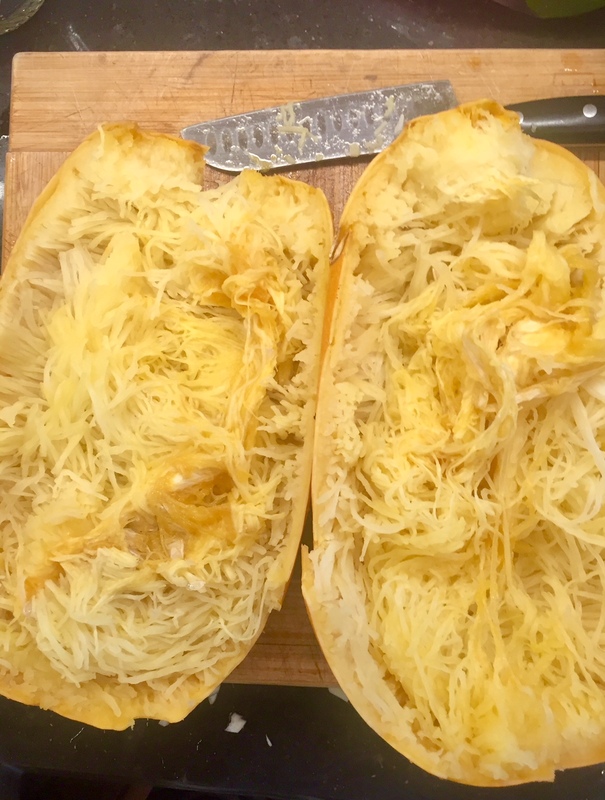 This entry was posted in climate change, Entree, Holiday, Side dish, Sukkot, Tishrei, vegetable and tagged cooking, Holiday, Jewish, poverty, stuffed squash, Sukkot, vegan by Sarah Newman. Bookmark the permalink. Poignant words from the heart – so important to remember the ecological devastation as we leave the comfort of our homes to go into the fragile sukkah.